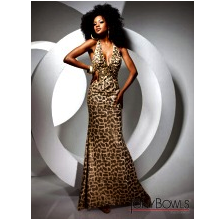 Prom Dress by Tony Bowls Paris Animal Print gown with halter straps and deep v-neckline. The fabric in this style is Sequin with Matching shawl included. Tony Bowls Paris prom dresses sold at TJ Formal are authentic original prom dresses direct from the designer.